Our hearts are as full as our pantry! Thank you so much to our friends at Cumulus Topeka, KSNT, Seabrook Apple Market and all of the shoppers who donated for today’s Fill the Pantry drive. 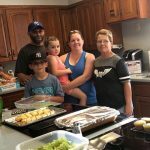 We received more than 50 pounds of chicken, roast, bacon, sausage, pork chops and ribs for our freezer; milk, bread, butter and eggs; $70 in gift cards; three books of stamps; and more household and nonperishable food items than we can believe! The acts of kindness and generosity we witnessed today are incredible. 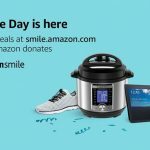 Thanks for helping us keep families close! 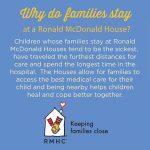 with RMHC news and stay in touch with your fellow RMHC friends and supporters. The following trademarks used herein are owned by McDonald's Corporation and its affiliates: McDonald's, Ronald McDonald House Charities, Ronald McDonald House Charities Logo, RMHC, and Ronald McDonald House. RMHC is a nonprofit, 501(c)3 organization. Your financial contributions are tax deductible and directly support the mission-critical programming of the organization.